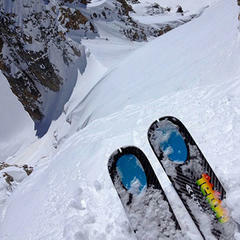 Before dropping the Middle Teton, Griffin Post and his crew had the opportunity to contemplate their sanity. If hiking for your turns during the spring means you’re committed, what does hiking for you turns during the peak of summer make you? Aside from chemically unbalanced, it makes you lucky. 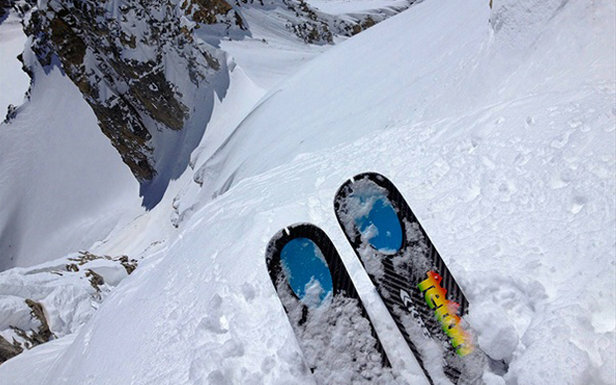 A number of glaciers still exist in North America (believe it or not), from the Sierras to the Tetons, offering skiers and riders excellent backcountry skiing and summer ski touring opportunities. Here are our top five spots to scratch (or should we say shred) that summer itch. Iconic, daunting and beautiful, the Glacier Route of the Middle Teton is no cupcake. The lengthy trek tops out at 12,350 feet and delivers some 7,000 plus feet of vertical straight to your quads (trailhead to summit). Be prepared to leave in the wee hours of the morning and to do some serious bootpacking near the summit. Just as the park's name implies, summer skiers and splitboarders will find multiple options for glacier fed turns in Glacier National Park. Salamander Glacier spans approximatley 42 acres (as of 2005) at an elevation of 7,200 feet. The glacier sits on a shelf on the east side of the arete. Salamander Glacier can be reached via Grinnell Glacier Trail (the trail is 5.5 miles one way and gains 1,600 vertical feet). When your friends ask you what you did today over a round of beers this August, you can cooly reply, "Today, oh, I skied a volcano." Mount Shasta is located in the Cascade Range of northern Calfornia, boasting a 14,162-foot summit. 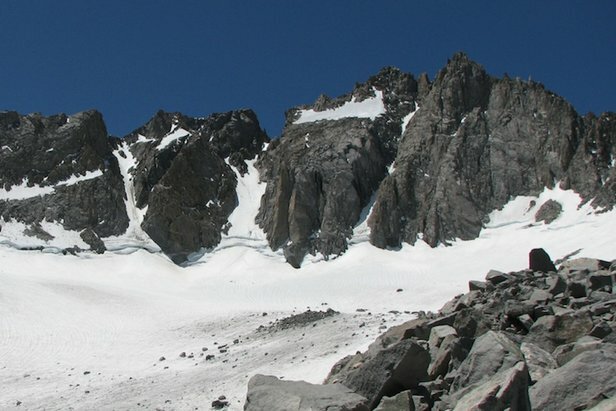 To access the Hotlum-Wintun Glacier, take the Brewer Creek Trail to the north side of the Hotlum-Wintum Ridge for direct lines and crevasse-free descents. Palisade Glacier beneath North Palisade Peak. Located in the John Muir Wilderness area of the Sierra Nevadas, Palisade Glacier descends from North Palisade Peak (the third highest peak in the Sierra Nevada range at 14,242 feet). 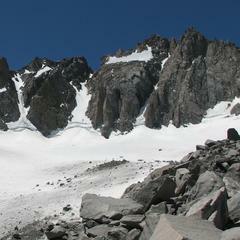 Hike or skin up the North Fork of Big Pine Canyon to access the glacier. Bootpack up the glacier beneath the vertical walls of Temple Crag and descend nearly 2,000 feet to Third Lake. View of Mt. Rainier from Summit House. 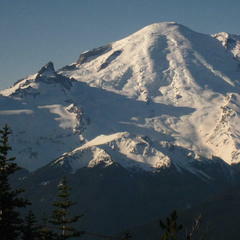 Mount Rainier claims the highest point in Washington state, scraping the sky at 14,411 feet. 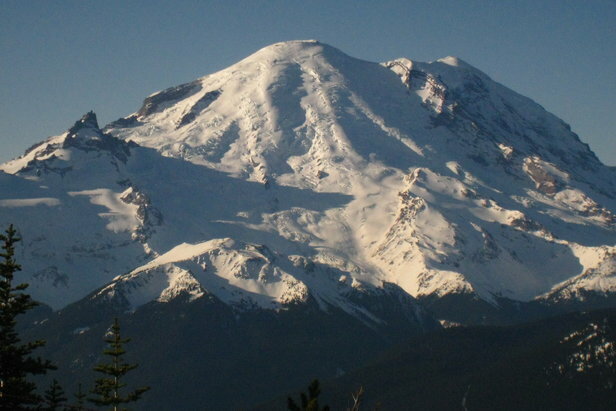 This stratovolcano is a training ground for mountaineers across the Northwest, providing a variety of ascents and descents. Paradise Glacier is home to a number of crevasses, so it's best to ski earlier in the summer and be aware that route selection is key. To mitigate the danger, hike up the relatively crowded Muir Snowfield to access the Paradise descent. Expect to pay a climbing fee and obtain a climbing permit (if required) before attempting some or all of these climbs. Note: heavily researching each of these hikes is recommended, as they vary by skill level and can be extremely dangerous to the uninitiated climber. 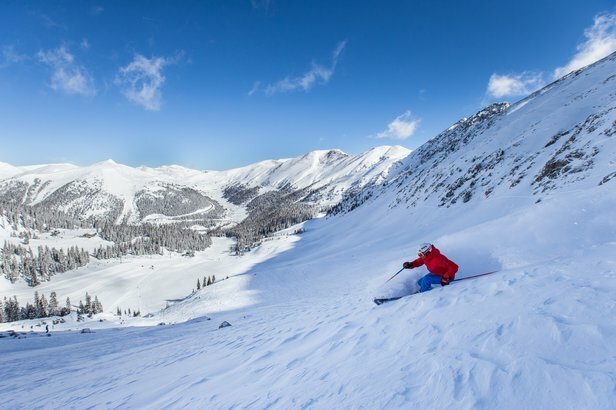 How to craft a spring ski day strategy to optimize the best ski conditions and avoid the bone-rattling, breakable crust.